Players: 2 – 4 One person must be Bunny to check answers. 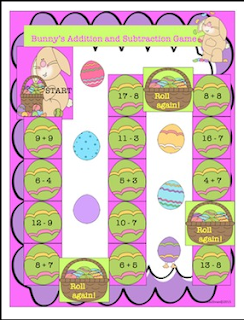 Directions: Players use 1 die to move around the Easter eggs. If you land on a basket, take another turn. You must answer the problem correctly or you will have to skip a turn. Bunny will check your answers. Winner: The first player to reach FINISH, is the winner. You must land on the FINISH with the exact number of eggs you need. For example, if you need a 2 to reach FINISH, you must roll a 2.